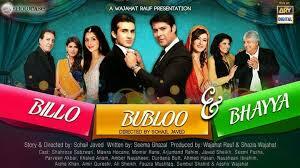 Billo Bablu & Bhaiya is a comedic tale full of love,mischief and happiness. The story revolves around� two brothers, Bablu and Bhaiyya and their love interests.With Bablu and his soul-mate Billo, trying desperately� to get Bhaiyya to reconnect with his former flame Alizeh.� Because until the older brother is not married,� the younger will have to wait. So the young and restless� Bablu and Billo, embark on a mission to win� the hearts and approval of the entire family.Directed By: Sohail JavedWritten By: Seema GhazalCast :Mawra Hocane,Shehroz Sabzwari,Moammar Rana,Javed Sheikh.